This is a quick checklist for beginners to help understand some of the core items that go into a well rounded digital marketing campaign. Hopefully this will help you avoid the pain that goes into hiring an agency or understanding what goes into setting up a digital marketing campaign. In this document, I will cover only the foundation items. If you are just starting out, this will be an excellent briefing. If you are experienced, you can skip right ahead. This has been written, mainly with a beginner’s point-of-view in mind. There’s a ton of things that go into marketing any brand or website online. Understanding the core aspects that go into Digital Marketing will help you stay on top of things if you choose to outsource your need to an agency. The details of every aspect and strategy, can always be explored later once you get a good grasp of what you are up against. There are some top blogs online that only focus on individual topics, and once you are ready to dive deep – you can start looking around for experts in each domain. If you want the PDF download version of this post, or the checklist mind-map and some of the other amazing marketing ebooks you will need to opt-in from the form below. First things first – you need to understand who you are targeting. Defining your customer avatar helps you understand who your target market is. There are advanced guides that talk about the process of doing this. You need to be absolutely clear in your mind before you define and push out any marketing message. This step will help you clarify what your typical customer characteristics are. This is by far the most important foundation point. If you get this wrong – you will be sending out the wrong message to the wrong people. Knowing who your customer is one of the most essential elements of any form of marketing. I always like to start any digital marketing strategy by first tightening up my Conversion Rate Optimization. This ensures that no matter how much traffic my site gets, I am maximizing the conversions. Without this in place you are wasting your efforts when you drive traffic to your site. Conversion Rate Optimization (CRO) is nothing but optimizing elements on your site so more people take the specific actions that you want them to take, such as opting in or buying a product etc. There’s countless elements you can change around and optimize / improve to give you better CRO. Some of them are – writing better site copy, having a better Call-To-Action (CTA) button, changing the design of your site, changing the Header main text, restructuring your site, changing price of items… the list goes on. Basically, it covers every on-site element that the visitor sees and interacts with. Selecting your KPI (Key Performance Indicators) will help you measure how things are moving along when compared to your goals. KPIs could include things like visitor traffic, clicks, sales, opt-ins etc. Calculating your ROI (Return-On-Investment) will help you see if your campaigns are profitable or not. You could setup certain ROI targets in the short and long term and then tweak your strategies as you work towards achieving them. Setting up a Google Analytics account will help you get an in-depth view of a slew of data. You can easily measure visitor traffic, where they come from, how they behave on your site, which are popular pages, what your bounce rates are, what dwell time your posts are getting, how people are behaving on your site and a ton of other metrics. This is a must have integration for all websites and its totally free. Setting up UTM parameters basically give you the ability to measure exactly which links you share with the world produce traffic to your site. It gives you the ability to track where users are clicking when you do any kind of campaign – be it an email promotion, pay-per-click ad, forum post etc. If you are going to have people eventually buy product or services from your site – you need a good Customer Relationship Management (CRM) software so you can see which customers are at what stage in their buying cycle – and therefore take certain steps to influence their decision. A CRM is also required to service your customers after they buy your goods or services. It will help you and your team manage them by letting you get access to key insights about each of them in one single place. You need to integrate Retargeting Pixels (from Google and Facebook mainly) into your website so you can send out messages in the form of ads to call your previous visitors back to your site and move down your conversion funnels so they interact with your brand and become more familiar and committed. Understanding and Defining what the different customer journey points are when you present your offer to people is very important. They could be completely new to your brand – top of the funnel, and then move down the funnel as they interact and become more familiar and comfortable with your brand. All this need to be integrated with your CRM and with trigger points in your Analytics and KPI measurements. You must always have access to see what your customer retention rates are and how your key monetization cycles are performing. Setting up a heat-map on your site will allow you to gain insights on how people actually behave on your site – how they scroll through individual pages, how their mouse moves and what they click on etc. allowing you to see the high-density points of attention on your pages. This data is priceless while trying to improve your and tweak your site for best conversion rate optimizations and specific call to actions. A/B testing allows you to have two different versions of the same element that is being tested, for example a web page or an advertisement over a period of time. It allows you to choose which the control group is in each cycle – so you can eliminate the loser, and choose the winning ad and then move on to the next testing cycle by introducing another variation of the element – to see if that can win against the control element. Multivariate testing is nothing but testing more than 2 live versions at the same time – and it should only be done in advanced stages as it can get fairly complex. When you go about executing a digital marketing plan, it is absolutely essential you lay out a schedule for various activities so you may be able to better track and tweak your goals – always checking to see what items are lagging behind or may need attention if they are mission critical elements that would slow down other dependencies. Maintaining a results document for each digital marketing campaign and creating a feedback loop for quick analysis and feedback is crucial. Having a solid email funnel that includes follow up messages and broadcasts is a key element so you continue to maintain brand positioning in the minds of people who have opted in to interact with your brand through email messaging. Setting up email funnels is a process by which you create autoresponders that are triggered to broadcast out to subscribers at specific time cycles that are set by you based on how you want to indoctrinate them. You can create segments of your follow up email funnels based on how people interact with your emails or what actions they take as a result. The simplest form of this would be to send a different set of messages to a subscriber if they click on a link in a specific email you send to them. This is called segmenting subscribers in an opt-in autoresponder list. The performance of each email message needs to be tracked and optimized so you can keep improving your tactics and strategies. Pushing out promotional deals and one-time irresistible offers is probably one of the strongest revenue generators in most email lists. You need to be careful not to “spam” continuous or non-related offers to your list or they will unsubscribe and drop out. Social Media Marketing will allow you to reach out to your potential customers through multiple social channels like Facebook, Instagram, Linkedin, etc. through various methods of interactions. Understanding which social channels are an ideal place for your audience is important. For example – Linkedin may not be the right place for certain niches. You will also need to understand where within each channel your audience gives their attention, for example which groups or fan pages on Facebook. Many social marketing elements may be automated without any risk. You need to define and understand which these are. Build a solid social media content posting and interaction plan so your brand is always visible – without overdoing it. Make sure you have a theme in your interaction. A specific look and feel that matches your brand and maintains consistency in your interactions with your audiences. There are several tools that will help in automation and you need to set these up for maximum output with minimum input. Search Engine Optimization (SEO) and Content Marketing go hand-in-hand nowadays. Gone are the days when you could rank with poor content and by spamming sites with your backlinks. Google has evolved exponentially over the past few years and if you want to play the game of ranking high in Google you absolutely need a solid content strategy and execution. Before you define and push out your message you need to clearly define what your typical customer characteristics are. This is by far the most important foundation point. If you get this wrong – you will be building out the wrong message to the wrong people. Knowing who your customer is one of the most essential elements of digital or any other form of marketing. Understanding which keywords or phrases your potential site visitors type into Google while looking for what you can offer them – is very important. It will allow you to see which keywords will give you maximum ROI based on your budgets and timelines. You could go for easy wins (non-competitive keywords) that are easy to get top rankings for or you could go for the more competitive keywords. You can balance out your strategy for each of them based on each of their potentials – more specifically how much their monthly search volumes are as compared to how difficult the keyword is to rank. Doing a solid competitive analysis before you begin any digital marketing will help you see ahead of time what your competitive landscape looks like and what you can realistically expect with your budget and time. It will also allow you to spy on where your competition is focusing, find any open gaps, and even copy and improve on their best performing strategies – thereby giving you faster results. You can completely bypass all the money and effort they spent by getting to their point, because you won’t have to experiment to see what works. Just (out) do strategies that the top ranking sites are doing! You must always know what each visitor to your site is worth, how many of them take the action you want them to take – so you can measure what kind of returns you are getting with your SEO efforts and rankings. Setting up a rank tracking tool for your various keywords is also a very important metric as it will allow you to see what SEO efforts produced rank changes for you. On-page optimization is one of the most important ranking factors today because it influences how visitors interact with your site and gives Google all the right technical signals. Since, Google is tracking how users behave on your site via Chrome browser and they compare that with how users behave on other sites in your niche or with the same topical page content. Sites with more interactions, higher dwell times, low bounce rates, higher call to actions, and high terminations of search query – will get a better quality score in the eyes of Google and therefore rise up the rankings. I have written an extensive post on everything that goes into doing a thorough job with your on-site factors here. When users query Google looking for specific products and services that are bound by geographical locations, they see a “Snack Pack” or top 3 results that appears at the top of the page. These can be clicked on to see more results in what is called Google Local. Ranking here is different than ranking in organic results and you need to start by verifying your business through Google My Business service, and then building local citations and reviews in appropriate directories and sites that are local to your business region and your business niche. Every site must have a solid content strategy if they are to rank with SEO. This is absolutely essential and there is a ton of work that goes into this. You need to be an expert in your industry so Google knows that you are genuine and that you can provider Google users with what they seek in an authentic manner without being a poser. You need to understand your markets and come up with content ideas that appeal to them. Every piece of content can be classified into these three stages based on where the user is in their discovery cycle or buying cycle. Having perfectly written and catchy headlines will help you in getting a higher click-Through-Rate in the SERPs (Search Engine Results Pages) and also entice the reader to scroll down and spend more time on your page – all of which is tracked by Google and is a ranking factor! While writing your content, you need to clearly define what it is being written to achieve, which will essentially define if it is a long form content or short form. It could also help you decide if the post is a curated content post, a video, a point of view and opinion type of post. Every piece of content on your site must have one strong call to action or multiple call-to-actions if that is what you want. Having a call-to-action is critical as it not only helps visitors move around your site or interact with your brand – but since Google is watching all of this, it helps improve your quality score if the signals are positive. You must have a way to capture the email addresses (get the opt-in) of new visitors to your site. This will allow you to send them messages at any point of time as long as they remain subscribed to your list. The size of your list is often equated to your bank balance! It is an amazing asset that can be cashed in over and over again. This is a way to capture leads and get opt-ins from your site. It can be embedded within your posts in the sidebars, footers, within the content etc. Squeeze pages are pages that have a single very strong call to action which the user takes when they visit your page. There is no other way out for them other than to take that specific action or close their browser window or hit the back button. These pages have very high conversion rates if done properly, and there is nothing unethical about them! Link building is still one of the top 3 ranking factors, even with all the latest Google updates, Google cannot remove this as a ranking factor as backlinks to your site count like a popularity vote and the entire web infrastructure is based on it. Although Google is not closely tracking the traffic from each link to assign a link power signal to it – this is not the only factor that counts towards the juice a link gives you. You can get links to your site by reaching out to other bloggers or sites in your niche and offering to post high value content on their websites for free in return for some exposure, that is a backlink to your site. This is often called Guest Posting. You can visit other sites in your niche like forums, blogs, portals etc. and participate on them always giving them high value, while also dropping a link back to your website in your content or by mentioning your brand. You absolutely need to position your brand in the eyes of your market. Knowing where your market hangs out online is critical – so you can target them with precision for maximum benefit. Viral campaigns take a ton of time to craft and may not be ideal for every niche. However, if done right, and with perfect timing and execution – with the right piece of content and a small initial push that exposes the content to the right markets – it can cause things to go viral and give you a ton of traffic and exposure. Maintaining a positive brand and image of your site is essential. People behave in the strangest of ways, and a single bad comment or post on sites like Rip Off Report – can be a nightmare to deal with and can cost you loss of substantial business. Dealing with this in a proper manner – could include talking calmly to the initiator. If that does not work you will need to do some SEO such that your branded profile pages on Social Media outrank the negative content pages off the front page of Google when someone searches for your brand. Google changed the rules of SEO several years ago and started penalizing sites for doing what is called “Black Hat SEO”. These shady methods got millions of sites penalized by Google which meant a drop in rankings for some or all the keywords the site was ranking for or in many cases a complete “de-indexation” of the entire site from the Google search results. Paid traffic is amazing as it is traffic that once mastered can be turned on or off like a tap of water. When you want traffic to your site you turn the tap on and, when you want to stop the flow you turn it off. However, like all strategies – you need to make sure that the amount you spend results in positive ROI like every other strategy. Paid traffic can come in different forms like Pay-Per-Click (PPC), Pay-Per-Lead (PPL), Pay-Per-View (PPV), CPM Ads (Cost-Per-Thousand Views), CPA (Cost-Per-Action), Buying Sponsorship Ads, Buying Reviews on Blogs, Buying Banners on Niche Forums, and anything where you directly pay a channel to send you eyeballs. Like the other strategies, you will need to define your Customer Avatar, Customer Journey through your interactions (cold, warm, hot) and which specific platforms you would like to use to reach out to your audience through paid ads – Google Adwords, Facebook, Linkedin, direct Advertising on niche sites, Paid reviews, Paid promotional direct emails, etc. Retargeting is nothing but the ability for you to follow a site visitor when they land on your site with a series of ads as they go about surfing online. Once they hit yoru site you drop a facebook or google adwords cookie in their browser and then you serve your ad as they visit other site and sections in facebook. Since they visited your site, or specific page, or took specific actions on your pages – you can customize your message to them. For example if they visited a page selling shoes for a particular brand in your online sports shop – you can show them latest shoes on sale from that brand! You would have seen this happening a lot with you as well. This is by far the most popular way of paid advertising online because the costs for retargeting are very low and cost effective as compared to targeting a cold audience of first time visitors on other sites that have never interacted with your brand or site. All in all, you need to pick the areas based on your time and budget and available resources to put into your projects. Make sure you don’t go all out on everything, as that is a sure way to lose focus (unless you have deep pockets and are launching aggressively). Pick the areas you want to focus on and build up the speed gradually – always measuring the effectiveness of your strategies and tactics as you go along. 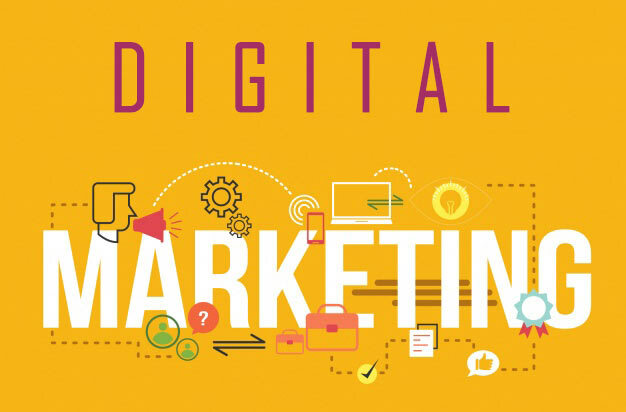 I hope you enjoyed this brief overview of Digital Marketing as much as I enjoyed making it. If you have any questions feel free to drop a comment below and I’d be more than happy to help you. Please opt-in below if you want to be updated, or download ebook version of this post.